Author(s): Tarkase K. N., Tarkase. M. K., Deshpande. A. P, Wagh. 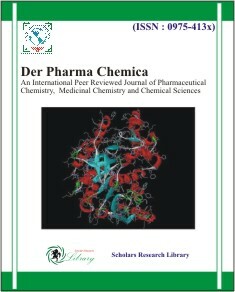 V. S and Dokhe M. D.
Author(s): D. Ben Hmamou , R. Salghi , A. Zarrouk , M. Messali , H. Zarrok , M. Errami, B.Hammouti , Lh. Bazzi , A. Chakir. Author(s): Rabindra K. Nanda, Subodh S. Patil and Dipak A. Navathar. Synthesis, Characterization and Antimicrobial Activity of Metal Chelates of 2-[(8-hydroxyquinolinyl)-5-aminomethyl] 3-(4-Bromophenyl)-3(H)- quinazolin-4-one. Author(s): Hareesh M, Srinivas Mahanti , Sailu B, Subramanyam D, Saidu Reddy Sakam, Tara B, Balram B, Vasudha B, Ram B. Author(s): Seranthimata Samshuddin, Badiadka Narayana, Balladka Kunhanna Sarojini,Hemmige S. Yathirajan and Ramappa Raghavendra. 4-Aminoantipyrine as corrosion inhibitor for zinc in phosphoric acid. Preparative Method of Novel Phthalocyanines from 3- Nitro Phthalic Anhydride, Cobalt salt and Urea with Chloromethylpolyestyrene as a Heterogenous, Reusable and Efficient Catalyst. Author(s): Mohammad Ali Zolfigol, Ali Reza Pourali, Sami Sajjadifar and Shohreh Farahmand. Spectrophotometric Simultaneous Determination of Dapoxetine and Sildenafil in Combined Tablet Dosage Form by Absorbance Corrected Method. Author(s): Anuruddha P. Chabukswar,Bhanudas S. Kuchekar, Sonali L. Patil, Swagati A. Moon,Subhash G. Chate, Bharat D. Pagare. Author(s): K Ashok Goud, J N Narendra sharath chandra, L.V.G. Nargund, Shachindra.L.N,Chidvila.V, S. Ramya silpa, V. Balakrishna. 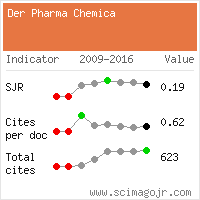 A stability indicating RP-HPLC method development for determination of ezetimibe in tablet dosage form. Stimulation of the hydrocarbon compounds degrading Saccharomyces rosinii by low power laser radiation. Author(s): A.Y. El-Naggar, Y. M.Shetaia, K. A. Youssef and N.A. Ismail.